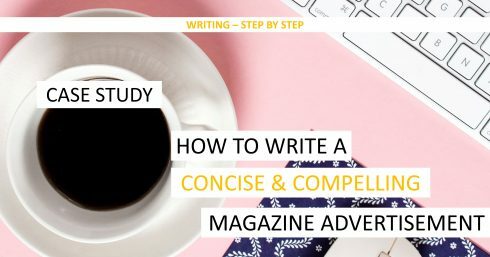 In this case study, you can see how I worked around complex subject matter and information overload to craft a concise and compelling magazine ad. 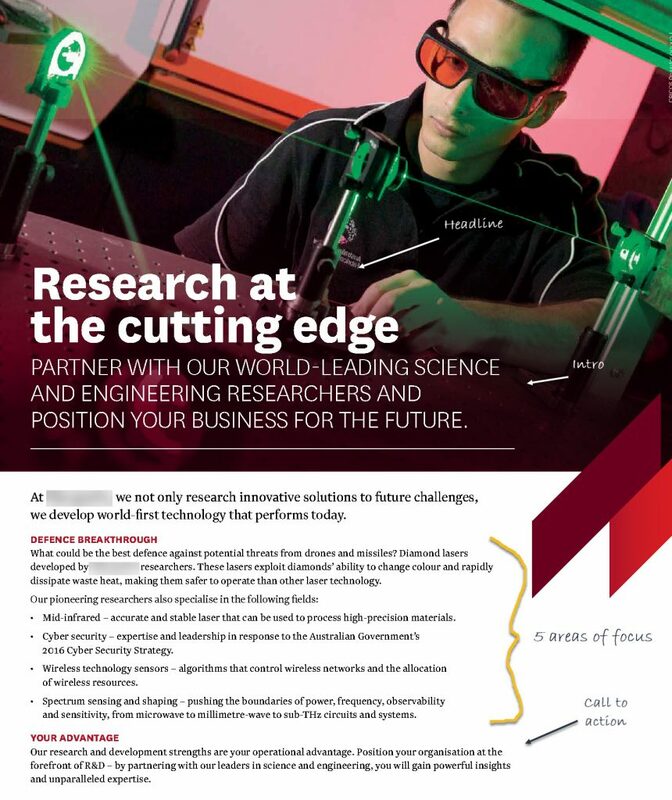 My client needed content for a one-page advertisement in a science and engineering magazine. I enjoy the challenge of writing to a specific word count or space. This time, though, it was up to me to determine how much information to include. Remember KISS? 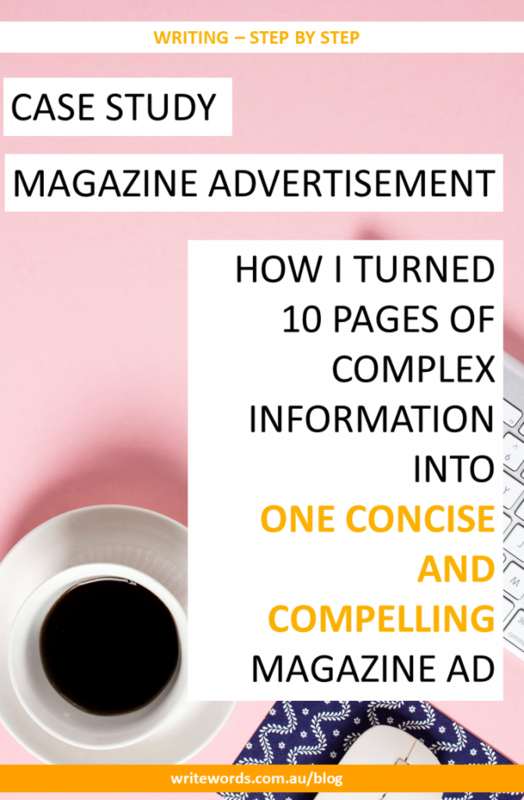 Less is usually more when it comes to advertising, but this was somewhat daunting with a subject matter I knew little about – and 10 pages of complex information to trawl through. Here’s how I whittled it down to just one page. Write with more confidence with 3 simple tricks. First, I needed time to take in the detail of the brief, which included five areas of focus. Even before I read the background information, these focus areas became my temporary sub-headings. With a different colour for each sub-heading, I highlighted my way through the background material – only the most important points though. Once I had my head around the subject matter, I was able to add content to the sub-headings. I either used already-written snippets of information or I selected a key word and, one word at a time, added my own words around it. When I’m reshaping existing content, it’s easier (than in other writing situations) to take it slowly and write specifically for the audience from the outset. It’s easier to focus on language I know will appeal to the reader. With the main body drafted, I turned my focus to the call-to-action – the benefits on offer to the reader (potential clients or partners) – and what my client would like them to do next. See the sub-heading Your advantage. Do you write too many words? Then came the subheadings. I mentioned earlier I came up with temporary sub-headings; once the content had taken shape, I was able to delete them. However I still needed a couple of sub-headings to break up the text, guide the reader and engage the reader if they scanned the ad. The first sub-heading contained a ‘power word’ – breakthrough. This, combined with the word defence, gives a clue as to what follows. The second sub-heading – Your advantage – was all about the reader; how they would benefit and what they should do next – the call-to-action. Next, I needed a headline and introduction that would grab attention and urge the reader to keep reading. Cutting-edge research and development – critical to tomorrow’s defence – by world-leaders in science and engineering. Partner with our world-leading science and engineering researchers and position your business for the future. The client went for option B, which is descriptive – letting the reader know what they were in for. I included option A as I thought it was a little more compelling. Which option would you have used? Comment below! Although the ad is short, writing it took about three hours. I drafted, refined, took a break and refined again before running the ad by my test audience to ensure nothing was amiss. If your document is short, and you just can’t find the rhythm, take it one word at a time. Use a keyword from your reference material and slowly work around it. I hope you’re able to apply some of these tips to your own writing. Questions? Thoughts? Leave a comment below. Receive more writing tips – free into your inbox. Join now! Like this writing tip? Share it with your friends and colleagues. Receive free writing tips and offers to help you write faster and with more confidence.